When you need a lift that can easily handle any job and give you the power and control you need, look no further than Dannmar alignment lifts. This equipment has been designed with versatility and flexibility in mind, capable of lifting just about any vehicle that enters your shop. You can handle any project quickly and easily with our high-quality equipment, and with the reliability and long lasting durability that comes with the Dannmar name, you will be able to enjoy the power your equipment provides you day after day without worry. 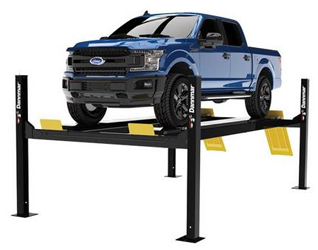 Formerly know as Major Series™ D-12A The Dannmar D-12/A alignment lift is the newest lift added to 4-post car lifts. With a bold 12,000-pound capacity, this lift is ready to take on all the demanding tasks of a professional shop. There are many advantages to using Dannmar alignment lifts in your garage. With powerful weight capacities up to 12,000 pounds, they can handle a large variety of vehicles with ease. Extended runways are a standard feature, further improving their flexibility in being able to handle various wheelbases without issue. Additional features such as radius plates that provide quick and accurate measuring and rear slip plates keep every Dannmar lift ready for action. Dannmar alignment lifts are also remarkable for their extensive list of standard safety features. A signature coating provides a powerful grip finish to the runways and ramps, providing superior traction under the greasiest of situations. Oversized, heavy duty steel cables provide excellent support for the lift and the vehicle and are built to last the lifetime of the lift itself. An extensively engineered safety lock mechanism has been designed to ensure that the lift will never drop a load under any circumstances, making these lifts some of the most reliable and safest on the market. You will notice the Dannmar difference when you choose one of their lifts for your shop. Take your mind off your equipment by using some of the most reliable and durable products on the market. These lifts can handle the toughest jobs every day and will perform for years.